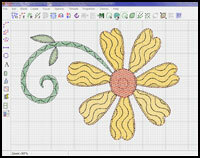 In most embroidery software, images tend to play a central role in the process of producing a successful embroidery design. SophieSew is no exception to this as it allows you to import a wide variety of pictures and clip-art directly into the worksheet. This demo will show you how to start an embroidery design session in SophieSew by first creating an image place holder and then importing your favorite picture or clip art into it. You will see how easy it is to position and zoom an image to to any comfortable working size within the worksheet. 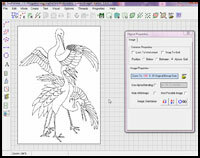 The next step in the digitizing process usually involves the creation of an embroidery outline around an imported image. 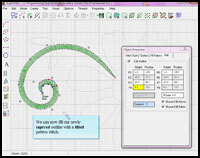 SophieSew allows you to create a basic set of curved outlines around which you can define the bulk of embroidery design. 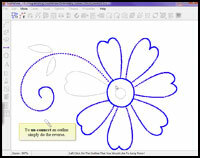 This demo will show you how easy it is to create and manipulate such an embroidery outline. It will also take you through the process of creating and editing the shape of curves and how to cut, copy, position and rotate them to facilitate the speeding up of the design process. So far we have a series of outlines traced over an image giving a framework of the embroidery design we wish to digitize. This demo shows you how to take the embroidery outline that was created in the last tutorial and convert it into a series of running and tapered zigzag stitches. It also introduces you to SophieSew’s attributes copy and paste functions. You can quickly select a set of attributes such as stitch type, color and pitch,copy and then paste them to new outlines. At this point in the digitizing process we have a series of separate outline stitch objects in the shape of our embroidery design. This demo will show you how to take these unrelated stitch outlines and connect them up so that they will stitch out as one object. Basically you will use SophieSew in join mode to quickly and easily define a series of connecting jump stitches between the outlines. We are now ready to use SophieSew to digitize filled stitch regions. SophieSew’s regions once defined are fully scalable and customizable. This tutorial will walk you through the creation of filled stitches step by step. 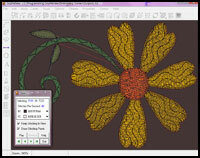 Learn how to create fully editable region paths that will give body to all your embroidery designs. 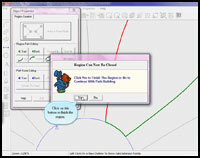 In the last demo we created filled regions of stitches using SophieSew’s curved outlines as a template. With this tutorial I am going to show you how to access and change a regions properties including Color, Stitch type and direction. I will also demonstrate how to create and use Underlay stitching to enhance and stabilize an embroidery design. Finally I will cover the topic on special fill patterns and how to use them. With this tutorial I will show you how to change the order in which the individual embroidery elements of your design are stitched out. I will also show you how to set and manipulate the jump stitches that link your embroidery elements together as well as how to associate the various regions and outlines that have been created, into one object, ready for outputting to a file format that your embroidery machine will understand. 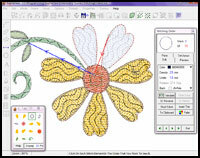 Over the last seven tutorials we have moved through all the basic steps required to complete a simple embroidery design using SophieSew. It is now finally time to output this design to a file format that is compatible and can be read by you embroidery machine. 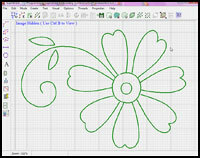 This tutorial will demonstrate how to use SophieSew to output to a series of expanded embroidery file formats as well as show you how these designs will look when loaded into a few of the commercially available embroidery software applications on the market today.